What do talented chefs enjoy cooking when they’re off the clock? September’s Bon Appetit answered the question featuring easy weeknight recipes from some of America’s top chefs. Dale Talde, the man behind Brooklyn’s Asian Fusion Restaurant, Talde, shared his recipe for a homemade chicken sausage wrapped in lettuce leaves. Not exactly grilled sausage with a side of kraut, but easy enough to make in 30 minutes, and a dandy, less fattening substitute for satisfying Asian take-out cravings. The magazine explains that fish sauce, a condiment that is derived from fish that have been allowed to ferment, is many chefs’ secret weapon, and a small bit goes a long way to add pungency to dishes — I might add to luggage as well. he chicken patties seem wet when molding, but after a chill in the fridge, they fry up fine. I was visiting friends down South, and instead of purchasing my hosts a present, I promised I’d make them a Thai dinner. Unsure if I could find fish sauce in their neck of the woods, I secured the sealed bottle in a double Zip-lock and checked my luggage. When I unpacked at my destination, the fish sauce had leaked, ruining my clothing as well as the suitcase. Lesson learned: Fish sauce is an odorous travel companion, but an essential condiment in Asian and fusion cuisines; at least I had enough left to make the meal. You can skip the fork and knife with this dish, making it perfect fare for sofa-sitting, remote-driven activities. Much of the world’s favorite foods, in fact, are hand-held. Think of America’s devotion to sandwiches, donuts, hamburgers and fries. So many foods across our planet were designed to be eaten with your hands using edible wraps — flat breads, rice paper, tortillas, edible leaves — and this dish is one of them. With his comment in mind, I decided to grind my own chicken in a food processor. I used boneless, skinless chicken thighs instead of breasts; the fattier thighs lend additional calories, but more flavor — isn’t that always the case with fat? I was tempted to incorporate some processed chicken skin for an even greater flavor kick, but refrained. Ground pork, beef (think Larb), or a vegetarian grind could be substituted for the chicken, if desired. You could use a grinder attachment on your food processor, or chop the chicken with on and off pulses until it is coarsely ground. This is what I did, but I imagine you could chop it fine, as Granger suggests with beef, using a sharp knife — or shop at Hillers. 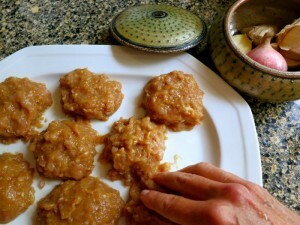 The patties felt wet and sticky when I was making them, and I was concerned they would dismantle in the skillet. After a brief hiatus in the fridge, however, they held their shape in the fry pan. Chef Talde must have spent some time on this recipe; it’s perfection to the teaspoon; my only alteration is to the amount it serves: four to six? I’d say two to three. And be aware that , as in so many savory Asian dishes, it’s sodium-packed; I’d advise against adding additional salt to the recipe. Indeed, you may dilute the fish sauce with extra lime juice or water, if desired, or place a glass of water on your bedside table. To make a dipping sauce, combine 2 tablespoons fish sauce, lime juice, sugar, half of chile and seeds, and 2 tablespoons water in a small bowl. Whisk to blend; set aside. Combine remaining 2 tablespoons fish sauce, remaining chile and seeds, chicken, shallots, oyster sauce, flour, and garlic in a medium bowl; mix until all ingredients are evenly incorporated. Using damp hands (to prevent the chicken mixture from sticking to your hands while forming the patties), shape chicken sausage mixture into eight 3-inch-diameter patties (scant 2 1/2 oz. each). Place patties on a plate. Cover and chill for 30 minutes to allow flavors to meld. Heat 1 & 1/2 tablespoons oil in a medium heavy skillet over medium-high heat. Add 4 chicken sausage patties and cook until browned and cooked through, 3-4 minutes per side. Repeat with remaining patties, adding oil to pan as needed. 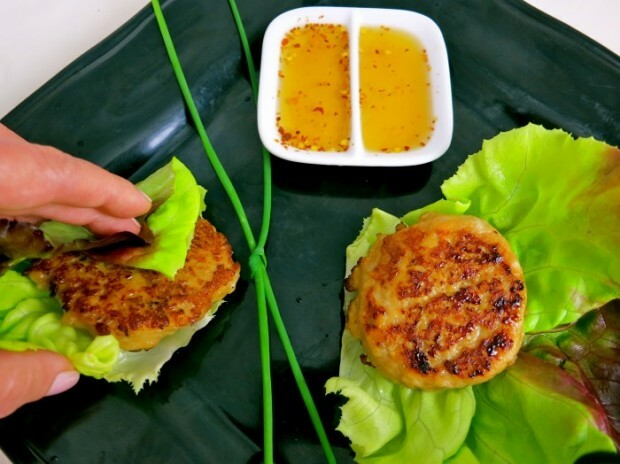 Place each patty in a lettuce leaf. Garnish with sliced scallion, if using. Serve wraps with dipping sauce. *Use plastic gloves when handling hot peppers, and omit the seeds if you prefer a milder dish.